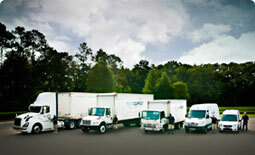 Professional and dependable staff – and we own our trucks! 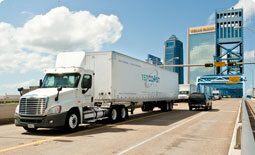 Jacksonville’s 1st Coast Cargo leads the freight transportation and logistics services market as the region’s leading Full-Service Transportation and Logistics Company serving commercial, corporate, retail, freight forwarder, and residential customers in NE Florida and SE Georgia. Known as the region’s most dependable and highly professional service provider 1st Coast Cargo also provides Final Mile and Installation Services as part of their cartage services offering. 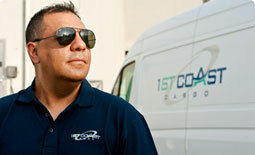 Our leadership has a focused commitment to excellence and dedication to exceed customer expectations 24/7/365. We continue to earn and are proud of our reputation as the premier transportation & logistics services provider in the industry. We Provide Professional Regional Transportation, Logistics, and Ocean Services 1st Coast Cargo maintains a full array of equipment including; cargo vans, sprinters, straight trucks, tractor-trailers, flatbeds, and chassis for drayage work. 1st Coast Cargo also provides customized distribution, pick-n-pack, and warehousing solutions to its customers with flexibility in order to meet each customer’s specific service requirements. Jacksonville’s 1st Coast Cargo is pleased to offer transportation & Logistics services in the NE Florida and SE Georgia since 1998. Jacksonville’s 1st Coast Cargo is pleased to offer services to North Florida (Duval, Nassau, Baker, St. Johns, Clay, Flagler) and South Georgia (Camden, Glynn, Chatham, Charlton, Ware, Lowndes, Brooks, Thomasville) counties, including a few in South Carolina. We proudly serve the Northeast Florida and Southeast Georgia ports of Charleston, Savannah, Brunswick, Jacksonville, and St. Augustine as well as the these FL cities: Fernandina, Fernandina Beach, Mayport, Atlantic Beach, Neptune Beach, Jacksonville Beach, Palm Valley, Vilano Beach, Nocatee, St. Johns, St. Augustine, St. Augustine Beach, Palm Coast, Daytona, Green Cove Springs, Palatka, Welaka, Gainesville, Alachua, Starke, Middleburg, Fleming Island, Orange Park, Baldwin, Macclenny, Lake City, Ocala, Live Oak and Tallahassee; and these GA cities: Thomasville, Valdosta, Waycross, Albany, Tipton, St. Marys, Brunswick, Jekyll Island, Sea Island, Savannah; and these cities in South Carolina: Hilton Head Island, and Beaufort.